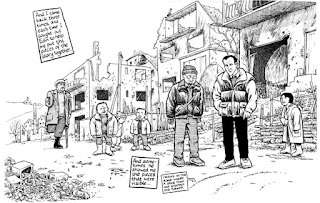 Summary (from the back of the book): In late 1995 and early 1996, cartoonist/reporter Joe Sacco traveled four times to Gorazde, a UN-designated safe area during the Bosnian War, which had teetered on the brink of obliteration for three and a half years. Still surrounded by Bosnian Serb forces, the mainly Muslim people of Gorazde had endured heavy attacks and severe privation to hang on to their town while the rest of Eastern Bosnia was brutally "cleansed" of its non-Serb population. But as much as Safe Area Gorazde is an account of the terrible siege, it presents a snapshot of people who were slowly letting themselves believe that a war was ending and that they had survived. Review: My brother was cleaning out his books and suggested that I read this one. I had previously read Joe Sacco's Palestine and thought it was good so figured I'd give this one a try. The art is so evocative of the emotions, the terror, the fun, the war, and the town. 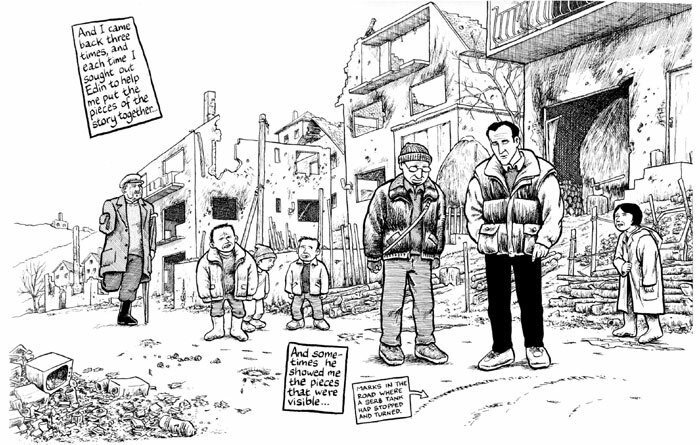 The reader really feels a sense of the desperation in Gorazde through Sacco's artwork. The war in the former Yugoslavia is complicated. I traveled there in the spring of 1986 when it was still Yugoslavia, just after the Chernobyl nuclear meltdown. I remember not being allowed to eat the fresh foods or sit on the grass to avoid contamination. Scary stuff! But, I digress. In the early 1990s Yugoslavia broke apart with the non-Serb areas being "allowed" to break away (Slovenia, Croatia, and Macedonia), while the Serb-controlled areas (Bosnia, Serbia, and Montenegro) struggled to define themselves and to keep the Muslim populations safe. As we know now, they weren't. For some reason, this town and its mostly Muslim population remained less destroyed by the Serbs. I don't want it to seem that life was easy: the Serbs burned houses and snipers shot people dead. Women were raped repeatedly by Serb soldiers. There were mass graves full of Muslim men. But the UN managed to keep life going there while other towns were overrun. Even when the UN pulled out, Gorazde survived. Sacco has a way of integrating himself into a population and getting to know the locals so that he not only tells the larger/wider story of life in a war-zone, but shows us daily life, its struggles and triumphs. And, for me, reading a graphic novel about a topic such as this one can be easier than a long non-fiction book.